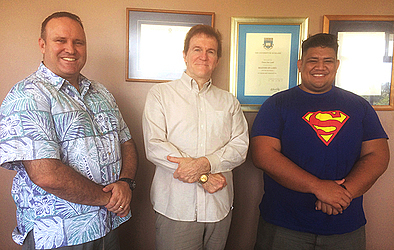 Oceania Kung Fu Wushu President, Walt Missingham, recently visited Apia to facilitate the formation of the newest Oceania Kung Fu Wushu Federation. President of Kung Fu Wushu, Travis Lamb, confirmed this to the Samoa Observer. He said Samoa joins Vanuatu, New Caledonia, Papua New Guinea, New Zealand and Australia in what is the expanding presence of Kung Fu Wushu in the Oceania region. “This is an important step as we move to achieve the recognition of Kung Fu Wushu as a Pacific Games sport,” said Mr. Walt. According to Mr. Lamb, this is an opportunity for Samoa to be a part of one of the fastest growing martial arts sports in the word today. Asked how Samoa will benefit from this? “Samoa will benefit in having another global sport that Samoans can participate in both locally and on the international stage,” he said. So what is Kung Fu Wushu? “Kung Fu is Chinese martial arts also known as Wushu,” said Mr. Lamb.